In memory of my father Reb Chaim Yosef ben Reb Yissochor Dov a”h. Forever in awe of how you survived and rebuilt your family after all you lived through. Yehi zichro baruch. Benny Groszman. I was officially registered as a “Polish child” in the Buchenwald Concentration Camp rather than a Jew, and owed my life to the saving power of the letter P, but daily life was still difficult. Yet with- in the darkness, there were several points of light. One image that is constantly in my memory is that of my older brother, Naphtali, repeatedly coming to the barbed-wire fence that surrounded my block. Each time he looked worse than he did in the previous visit, more gaunt, more emaciated. I, Lulek, his eight-year-old younger brother, would give him a slice of bread spread with margarine, which I guarded vigilantly for him. I recall watching with great satisfaction as he ate the thin slice, proud of my success – I had obtained a slice of bread for my saviour, I was permitting him to eat, and, perhaps due to me, he lost a little less weight. Naphtali’s continual updates kept me informed of what was happening among the Jews in the camp. Since I was very young, and never had the opportunity to learn about Judaism during the war, my knowledge of these customs and holidays was very limited. As Passover approached, Naphtali and his friends were determined to do anything to avoid eating leavened foods during the holiday. Although the only food available to them was the daily ration of three and a half ounces of bread, they were determined to observe the laws of Passover at all costs. Months in advance, at the beginning of January, they began to prepare by collecting potatoes. They told me about their arrangements and tried to explain their significance. Some of the prisoners had organised a trade in potatoes: three potatoes were worth the daily bread ration. and Chairman of Yad Vashem. 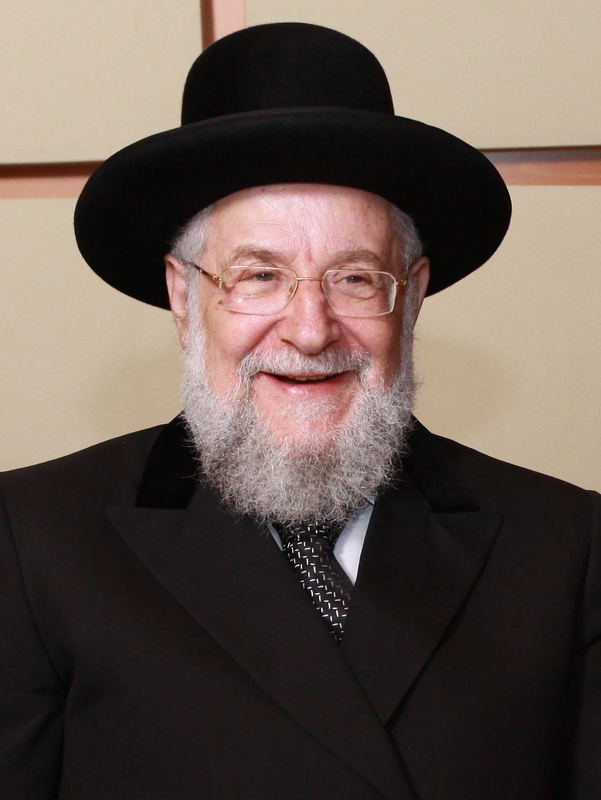 He previously served as the Ashkenazi Chief Rabbi of Israel from 1993 to 2003. Lau was rescued from the Buchenwald concentration camp and immigrated to Mandate Palestine with his brother Naphtali in July 1945. 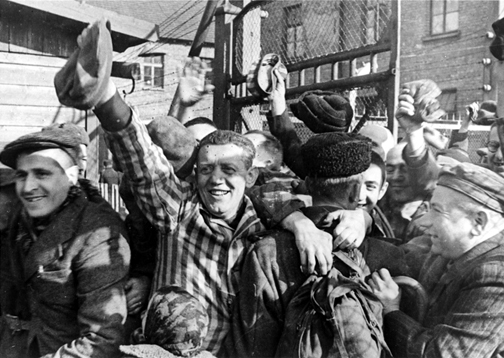 Russian forces liberate Auschwitz and Birkenau concentration camps. Himmler ordered the evacuation of all camps in January 1945, charging camp commanders with “making sure that not a single prisoner from the concentration camps falls alive into the hands of the enemy.” On January 17, 58,000 Auschwitz detainees were evacuated under guard, largely on foot; thousands of them died in the subsequent death march west towards Wodzisław Śląski. Approximately 20,000 Auschwitz prisoners made it to Bergen-Belsen concentration camp in Germany, where they were liberated by the British in April 1945. Those too weak or sick to walk were left behind. When the 322nd Rifle Division of the Red Army arrived at the camp on January 27 they found around 7,500 prisoners and about 600 corpses had been left behind. Among the items found by the Russians were 370,000 men’s suits, 837,000 women’s garments, and 7.7 tonnes (8.5 short tons) of human hair. 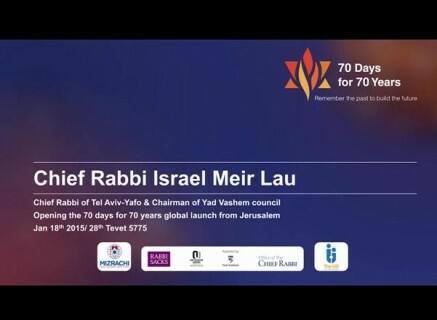 Former Ashkenazi Chief Rabbi of Israel, Rabbi Yisrael Meir Lau, a Holocaust survivor, launches the 70 for 70 project.